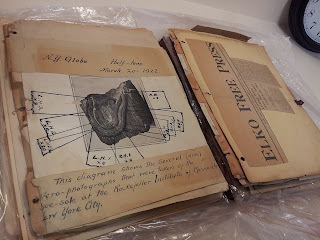 Thanks to an anonymous donor, we received this 1920s vintage notebook chronicling John T. Reid's alleged "Triassic shoe" fossil. The notebook was Reid's personal scrapbook about the find and contains correspondence from Alfred Watterson McCann and Sir Arthur Keith, among others. You can read about the subject of this notebook at Glen Kuban's site. Reid was a mining engineer who lived in Lovelock, NV, and from the reports I've seen on the web this morning, he seemed quite excited about "anomolous" fossils and archaeological remains. I'm sure that title got your attention. You might recall the unusual DNA found in Siberia from an unknown hominin dubbed "Denisovan." The mitochondrial DNA turned out to be very different from any other hominin known at the time. It was almost twice as different from modern humans than any Neandertals that had been sequenced.